Pictured left to right: Christopher Piotrowski and Eduardo Herrera-Mier of Associated Bank and Cecilia Gore of Brewers Community Foundation present a check in the amount of $100,000 to Trena Bond of Housing Resources, Inc.
MILWAUKEE – September 26, 2017 – For the third consecutive year, Associated Bank has partnered with Brewers Community Foundation to host the Hits for Homes program at Miller Park and donate a combined total of $100,000 to Housing Resources, Inc. (HRI). The donation supports home repair assistance for low- to moderate-income homeowners, which helps to revitalize neighborhoods in the Milwaukee area. 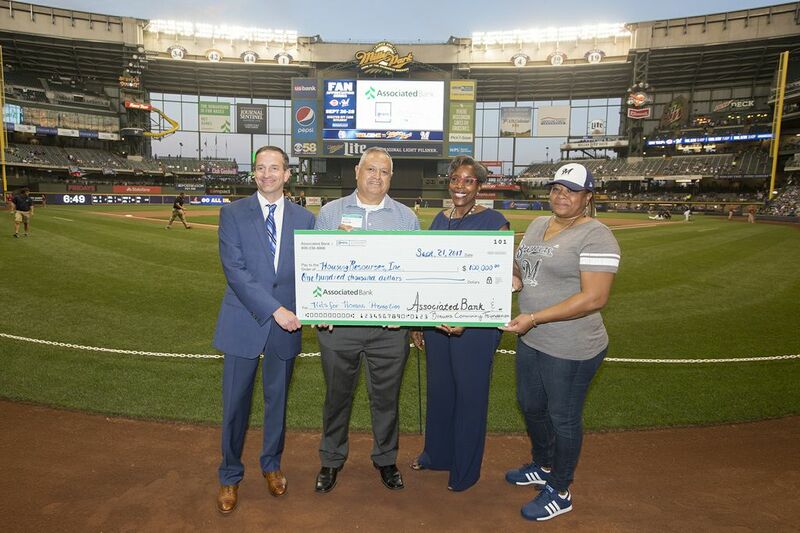 As part of the Hits for Homes program this baseball season, every hit recorded by the Brewers during home games resulted in a $150 donation to HRI, up to a combined total of $100,000. Each hit and donation was tallied on the Associated Bank LED board, located above the Check Deck in the outfield. Piotrowski explains that Associated Bank has been a long-term commercial banking partner of the Brewers and home of Brewers Checking™ and the official Brewers Credit Card. This partnership includes charitable activities to support our community as well as unique fan engagement activities to share Associated’s team pride. “Brewers Community Foundation and Associated Bank are aligned with our efforts to improve the quality of life in our community. We are pleased to partner and support HRI as they address the crucial need for quality housing,” said Cecelia Gore, executive director, Brewers Community Foundation.